The quick, easy way to a strong, clear brand. With the help of pictures and words, everyone gets the same clear picture of your brand’s personality. Brand Pics Test - The Box is a workshop tool where you use pictures and words to make sure everyone speaks the same language about your brand. And have fun at the same time. The entire organization having the same view of your brand is crucial for both clarity and profitability. With Brand Pics Test – The Box, you easily and quickly get a common understanding of the brand’s winning personality and ensure you deliver your brand promise in full. 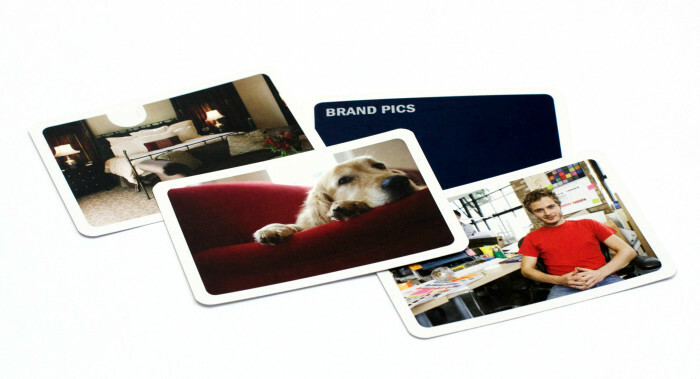 Brand Pics Test - The Box consists of 50 picture cards divided into five different personality types, each of which has 20 descriptive words. 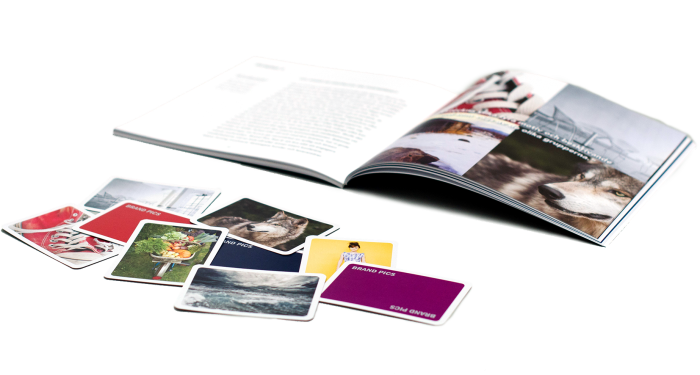 The cards come with an 80-page handbook with seven exercises that explain how you can find your brand's winning personality. Commitment is the key to successful branding. People want to have fun. Replacing traditional workshop discussions and exercises with an engaging game activates everyone involved. And the game gives you clear results in a short time. 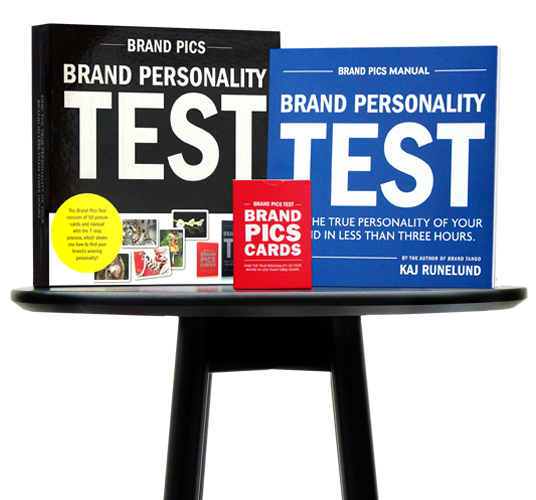 The aim of Brand Pics Test – The Box is to develop a clear brand personality and reach a common understanding that is the right one. The management team, employees, customers and suppliers can all play the game. 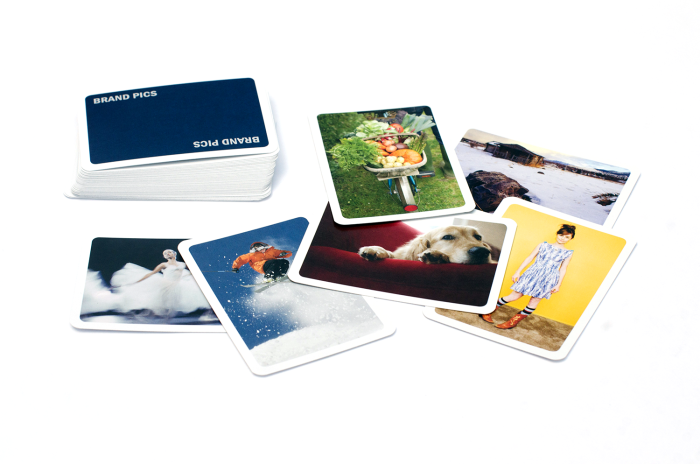 Put the cards on the table and let each participant choose four cards with pictures they together think describe the brand’s personality. Turn the cards over and sort them by colour. Each colour corresponds to a personality whose properties can be described by a number of adjectives. Compare and together go through the results. 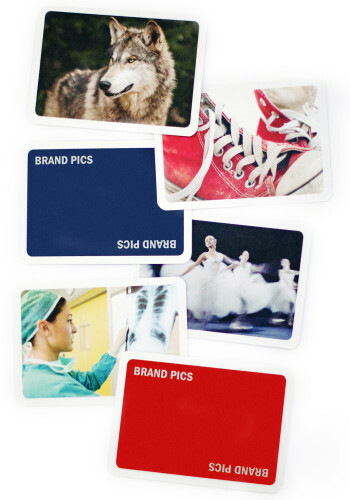 If everyone chose the same colour on the cards, then your brand image is clear. But if the colours are different, you need to work on internal communications to get a picture of the brand that everyone shares. Focus on the qualities that distinguish the brand and ensure that it is clear to management, employees and customers. Prices and tax: The prices are stated in Euro (€) and Swedish VAT-inclusive (6%) unless stated otherwise. Customers from outside the EU are entitled to a tax refund. The refund is applied automatically in the checkout price calculation. EU-customers are entitled to a tax refund if you can provide your full and valid VAT registration number in the order form. Delivery terms and shipping costs: The shipping cost outside Sweden are 9 Euro (€). Your delivery will be sent using UPS or the Swedish Postal parcel services depending on destination. Delivery time: Time of dispatch is 0-2 days. Delivery times to the EU and rest of the world takes from 2 to 14 days. We cannot guarantee delivery times in all cases due to unexpected delays. Please note that delays in customs and transit are outside our control. Secure card payment: We accept card payments using VISA or Mastercard debit or credit cards. The payment is handled by our payment partner Payex to guarantee secure payments. The card transaction is protected and encrypted by Payex at the time of payment. Card details are not stored after the order is finished.